Obviously, I love shopping, but not so much holiday shopping. Because I know what I want under the tree, but not necessarily what everyone else wants. So now, once again the pressure is on, and I thought I'd use this post to get a jump-start on my hunt for perfect people-pleasing presents that also cost under $100! 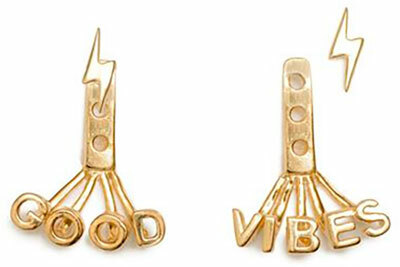 Let's start with the cute earrings, above; Good Vibes are what we all want for the holidays, right?! Other no-fail gifts: this Kayu vacay-ready mini tote, this stocking stuffer Coqui Coqui shampoo set, these J.Crew pajamas, this table-making decanter, this Smythson leather agenda, these soothing eye masks from Shiseido, and this striped Mark and Graham wine bottle carrier. Let me know if you have any good ideas too!